Learn about Lake Havasu, Arizona, by reading Lake Havasu - London Bridge in America Southwest by Charlie Spence, IFA Member and Aviation Writer. It features a mini, but thorough tour of the destination, plus all you'll need to know to plan your trip including getting there, objective information on places to stay and eat, and things to do. At the end of the article, we've provided a summary of the contact information for your easy reference. Enjoy! The town began as a planned community in 1963, but one of its attractions was constructed more than 125 years earlier. 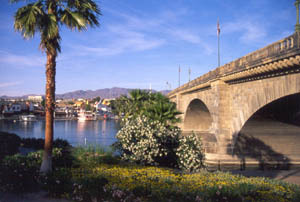 The London Bridge is just one of the enticing reasons to fly to Lake Havasu City on the Arizona/California border. Forty-five mile long Lake Havasu, formed on the Colorado River by Parker Dam, gives you a base for water sports ranging from paddle boating and canoeing to jet skiing, scuba diving, parasailing, and kayaking. You fans of fishing will find an abundance of striper, largemouth bass, black crappie, bluegill and rainbow trout. Rental boats are available and there are guided tours. 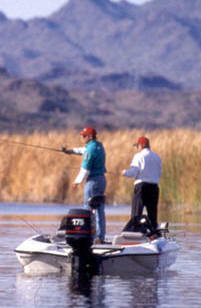 The lake's 450 miles of shoreline is dotted with secluded coves for perfect fishing conditions. If you think water is just for drinking, the area around Lake Havasu City abounds with other exciting adventures. Nestled amidst rugged desert peaks, Lake Havasu City offers a mixture of desert ecology and opportunities for lolling in the sun or participating in more strenuous activities. You will find public golf courses and tennis courts. Hike or horseback through some of the most beautiful desert areas. Catch a glimpse of wildfowl, wild burros, and bighorn sheep roaming their natural habitats in the Havasu National or Bill Williams River National Wildlife Refuges. If you are adventurous, take a jeep tour or a supervised climb in Havasu's Outback, the nearby Sonoran Desert and Mohave Mountains. In the city or just about any direction you take, you will find something of interest. To the west is the lake, to the north the Havasu wildlife refuge, to the east Crossman Peak natural scenic area, to the south Bill Williams Wildlife Refuge. Lake Havasu City is at the junction of two great deserts. East of the city in the rugged Mohave Mountains, the Mohave and Sonoran deserts converge to create a natural area of amazing plant and animal diversity. In the 26,000-acre Crossman Peak Natural Scenic Area, follow the old miners' trails leading to the abandoned mines where many a sourdough once sought fortunes in gold and silver. In 1963, McCulloch Properties founded Lake Havasu City for its employees. As the town grew, a connection was needed between the city's mainland and island sections. At that time, as the song says, 'London Bridge is falling down.' A bridge that had spanned the Thames in London since the 1830s was available. McCulloch bought it for $2,460,000. It was torn down block by block, each block numbered and shipped to Arizona where it was reconstructed at a cost of $7 million. It was officially dedicated in 1971 and has since become one of Arizona's tourist attractions. If you feel lucky having chosen a fine spot for a week-end or extended vacation, about 60 miles north of Lake Havasu City is Laughlin, the third largest city in Nevada, where hotels and casinos line the banks of the Colorado River. You will find it less glitzy than Las Vegas. Any time of the year is right to fly to Lake Havasu City area. You'll find warm, dry Arizona climate that permits outdoor activities all year-round. High temperatures in the winter months range from the high 60s to high 70s with the lows in the 40s. Summer brings more heat with day temperatures averaging 95 to 109 degrees. Average rainfall is less than 4 inches so you don't have to worry about having your outdoor activities rained out. Lake Havasu City Airport (HII) is just north of the city with an 8,000-foot asphalt runway (14/32). You'll find it 13 miles out on the 139 degree radial of the Needles VOR (EED). 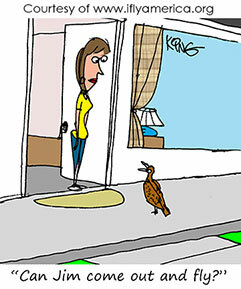 There are neither landing fees nor parking fees for day visitors. Overnight parking fees are charged. You probably won't need it, but there is a VOR/DME or GPS-A instrument approach. For noise sensitive areas, no straight in or out arrivals or departures are permitted. (IFR approach arrivals break off approach at missed approach point and enter traffic pattern.) Runway lights are pilot controlled. 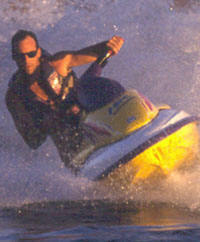 For more options or reservations go to www.golakehavasu.com.